Normally when a new book arrives I skim read the first page and then add it to the pile of books waiting to be read by my bedside. I say novel, but a novella probably would be a better word. "Congratulations," I said, and then, noticing it was rather light, added, "Is this all of it?" She nodded. "It's more of a novella than a novel," she said. 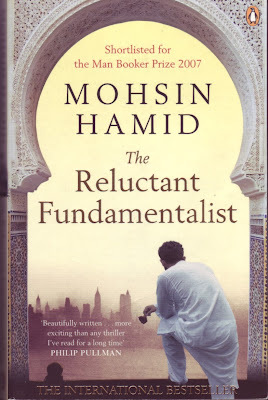 Small things are often all the more beautiful for their intricacy and The Reluctant Fundamentalist has a beauty, intelligence and story that invites you to keep turning it to examine its sparkle. I finished the book a few days later, which for me is fast. I like to savour a book rather than bolt it down. But this book was short and so easy to read, that I couldn't help myself. I lacked a stable core. I was not certain where I belonged in New York, in Lahore, in both, in neither. I thought in that moment that she looked older, more elegant; she had an element of that beauty which only age can confer upon a woman. But although not in the twin towers himself, he and love, his whole world, falls from the dizzy heights he has reached and leaves him washed back up on his native shore of Lahore. There we join him as a stranger enters a Lahore cafe. An American who Changez invites to join him as he recounts his lost love Erica and his loss of love with America. Is he praying, you ask? No, sir, not at all! His recitation-rhythmic, formulaic, from memory, and so, I will concede, not unlike a prayer - is in actuality an attempt to transmit orally our menu." The book is not anti-American, as some have said. It's not that Changez hates America, he's just seen her with fresh eyes and tries to get the locks to his house changed. In post 9/11 that is not allowed, you can't get a restraining order against the most powerful nation on earth and he is viewed with suspicion and eventually ... well you need to read the story! 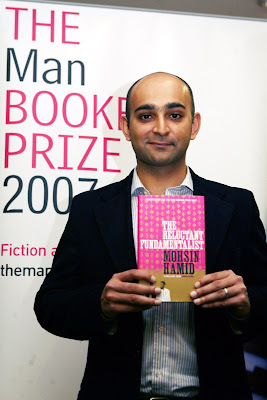 Mohsin Hamid was born in 1971 in Lahore, Pakistan, where he grew up. He attended Princeton University and Harvard Law School, worked for several years as a management consultant in New York and as a freelance journalist in Lahore, and now lives mainly in London. He published his first novel, Moth Smoke, in 2000, and his second novel, The Reluctant Fundamentalist, in 2007 which was shortlisted for the Man Booker Prize in 2007 and was chosen by The New York Times notable book of the year . To visit Mohsin Hamid's website click here.